Trevor Storton, arguably the most accomplished defender to play for Chester, has sadly died from cancer at the age of 61. Our condolences go out to his family and friends. The following article is taken from an interview with Trevor in 1994. Trevor Storton will be remembered by City fans as one of the best defenders to play for the club. A key player in the record breaking 1974/75 team he remained a fixture in the side throughout the 1970s and early 1980s and was an extremely popular player with the fans. In all he made 396 appearances for Chester, just missing out on the record of 406 held by Ray Gill. Trevor started his career with Tranmere Rovers who he joined straight from school. At Prenton Park he initially lined up alongside Roy McFarland and he stayed with the club for 5 years until Liverpool paid £25,000 for him in 1972. Trevor says that in some ways the move to Anfield was good because he was able to learn so much especially from Ronnie Moran who he says was an excellent teacher. On the other hand there were so many good players at Anfield that it was difficult to progress and Trevor only got a chance to play in the first team when Tommy Smith was injured. At the start of the 1974/75 season Trevor joined Chester not expecting the sort of success he enjoyed in that first season. One of his greatest moments was scoring one of the goals in the 3-0 League Cup victory over Leeds and he remembers playing particularly well against Malcolm MacDonald of Newcastle in the 5th Round of the same competition. At the end of the season he was voted Player of the Year by the supporters and also had the honour of being chosen in the 4th Division team of the year. Of the 1974/75 team Trevor says that although they didn't have any big names everything seemed to click together and everyone knew what each other was doing. Over the next 10 years Trevor was a consistent performer in the team and was fortunate to avoid any serious injury. Although he never scored many goals he particularly remembers one against Wimbledon when, in an uncharacteristic move, he cut in from the left and dribbled past 2 defenders before scoring. In November 1983 Trevor had a period as caretaker manager of the club when John Sainty left but this only lasted for 2 months until John McGrath took over. He feels that at the time he was unlucky because he did not inherit any outstanding players and was not given a real opportunity to manage the team. When McGrath became manager in February 1984 the two did not see eye to eye and although Trevor says he would have liked to have stayed he left the following month. After leaving Chester Trevor joined another ex-City player, Stuart Mason, at Oswestry where he also had a spell as manager. In 1987 Trevor joined Telford United and was captain of the team when they played at Wembley in the FA Trophy final against Enfield in 1988. Trevor was also in the team the following season when Telford returned to Wembley and beat Macclesfield 1-0. 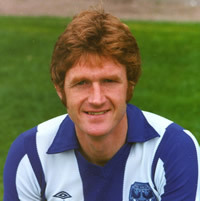 Trevor continued playing at Telford until he was 40 when he first became assistant manager and then manager of Chorley. He then returned to Yorkshire where he spent time as Assistant Manager at Frickley Athletic. Between 1997 and 2004 Trevor had a successful period in charge of Bradford Park Avenue and at the time of his death he was Assistant Manager to Neil Aspin at the reformed FC Halifax Town.